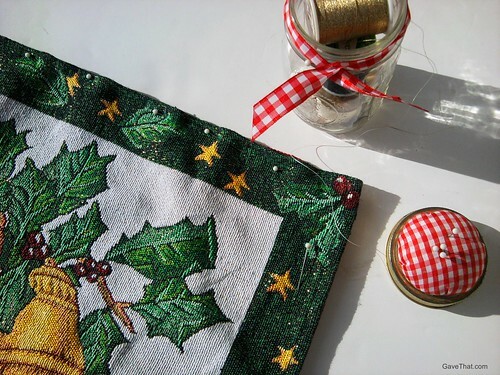 - DIY Gift Idea - We're getting down to the wire now! 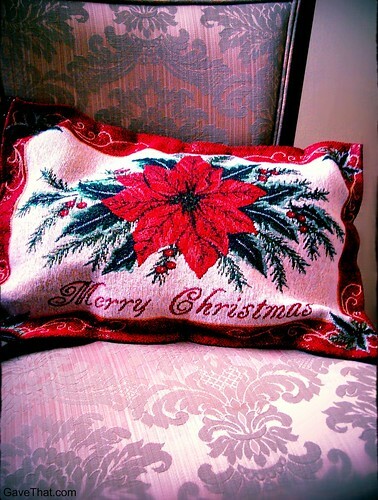 Still there are some really quick DIY projects and this is one I've been stitching together to sprinkle around the room, Christmas pillows. Only this time, to make everything easier and faster, placemats are being used in place of fabrics thanks to their already finished edges, zero need for cutting or turning and sparkly patterns. A little pinning, sewing or gluing is all that's required. Place wrong sides together (that back of the placemat although some are the same on both sides) and pin the two sides together under the finished (surged) edges. Either sew following the finished edge or glue the finished edges together, being sure to leave a small opening on one end to stuff the pillow. If gluing, paper clamps might be needed or a heavy book placed on top to be sure the edges adhere evenly. Stuff and then sew or glue the remaining opening closed. That's it! To make these extra special try placing cinnamon sticks inside, scented wax melts or sachets filled with wintery herbs and resins such as peppermint or myrrh. PS... to make the mason jar sewing kit above, see here.